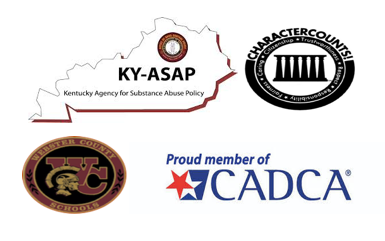 The former Webster County Champions Against Drugs became Webster County KY-ASAP (Agency for Substance Abuse Policy) in 2002. Since this time, The KY-ASAP Coalition has been proactive in preventing youth substance abuse in Webster County, Kentucky. Some of the programs for youth sponsored by KY-ASAP include Mini Teen Leadership Conference, Truth and Consequences, Motivating Mentors, Health Fairs, Project Northland, 5th Quarters, and Red Ribbon Week. Webster County “True Blue” Drug Free Communities is a partnership between Webster County School Board and Webster County KY-ASAP. The five year federal grant was submitted on March 13, 2017 and notification of funding was received on September 20, 2017. The “True Blue” Action Plan is a community drug prevention roadmap to better educate and inform all sectors of the Webster County community. The “True Blue” concept is around the notion that youth must be more “True Blue” to themselves, school, community related to risky behavior. This theme unifies our community partners around the message that character is our foundation to making positive choices. The 6 Pillars of Character Counts, Trustworthiness, Respect, Responsibility, Fairness, Caring, and Citizenship, are taught throughout the school district and the community. The Kentucky ASAP encourages WC residents to share the “True Blue” message by wearing blue on the 1st day of each month. Let’s “BLUE” out Webster County showing our support of a DRUG FREE COMMUNITY!